C anada’s Asian Coast Development Ltd, owner of the Ho Tram Strip, a group of integrated resorts in the southern province of Vung Tau, has received approval to operate casinos in the resort. The company can start operating its casinos as early as this year. The first phase of the first resort, costing some US$500 million, has been completed with 541 five-star rooms and suites, nine restaurants, Las Vegas-style casinos, convention and meeting spaces, a shopping mall, bars, a spa, and swimming pools. It was originally to open in the first quarter of this year, but was delayed due to the withdrawal of MGM Resorts International. The US-based gaming, entertainment and hospitality company MGM Resorts International in November 2008 signed an agreement with ACDL to provide pre-opening services and run the first resort. The reason for its withdrawal in early March has not been explained yet. The other shareholders in the project, Harbinger Capital and casino operator Pinnacle Entertainment Inc remain committed. ACDL is now building the second phase of the first resort, which will have 559 five-star rooms and suites and an 18-hole golf course. 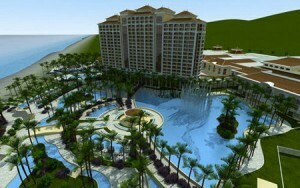 The Las Vegas-style resort, situated some 127 kilometers from Ho Chi Minh City, is estimated to cost around $4.2 billion. The project is planned to be finished by 2020 with 2,300 rooms in two five-star resorts, 180 gambling tables and 2000 machines. Entry will be restricted to foreigners and overseas Vietnamese.